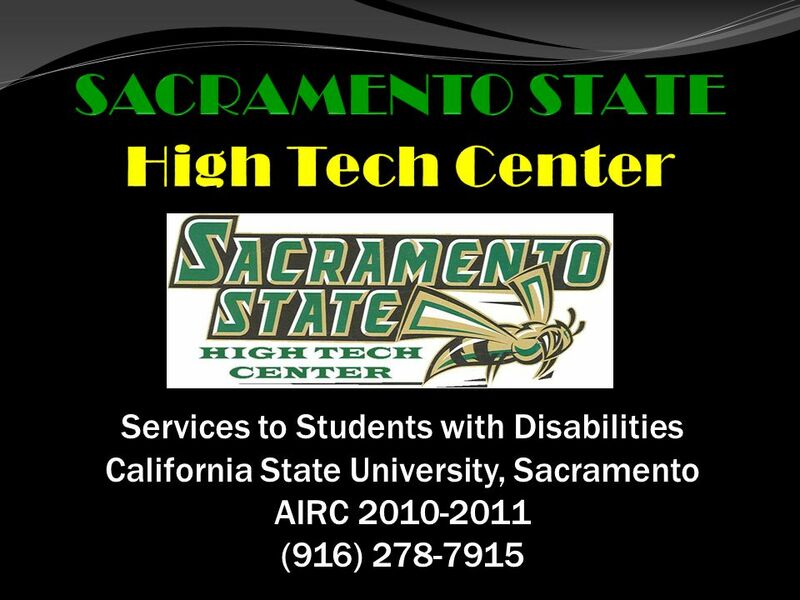 Services to Students with Disabilities California State University, Sacramento AIRC 2010-2011 (916) 278-7915. 10 Alternative Media What is it? 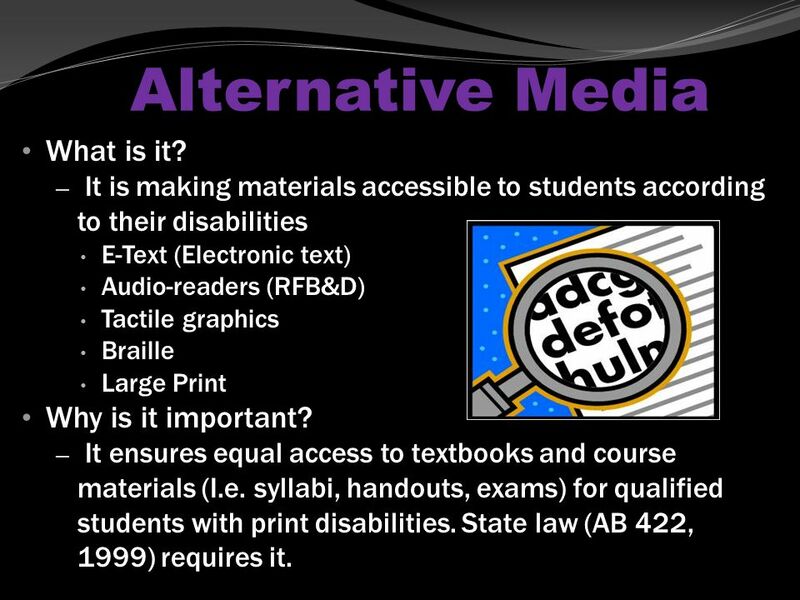 – It is making materials accessible to students according to their disabilities E-Text (Electronic text) Audio-readers (RFB&D) Tactile graphics Braille Large Print Why is it important? t ensures equal access to textbooks and course materials (I.e. 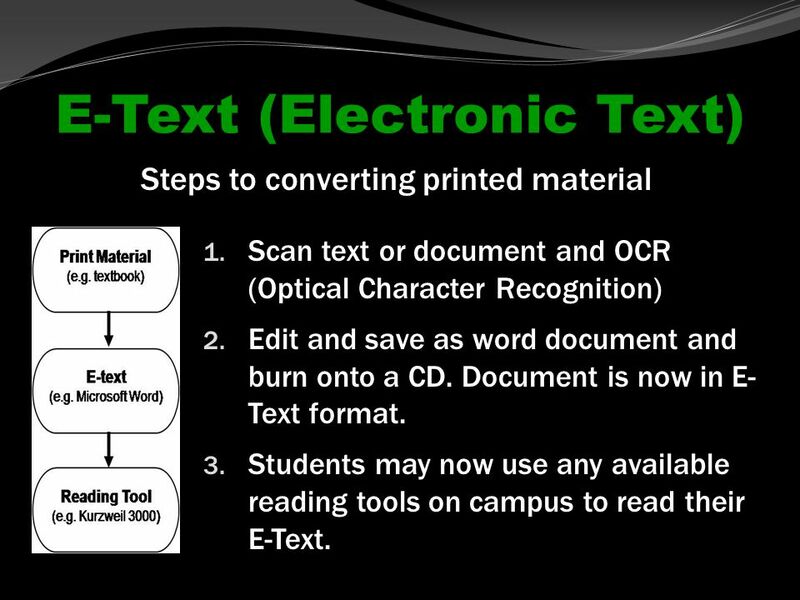 syllabi, handouts, exams) for qualified students with print disabilities. State law (AB 422, 1999) requires it. 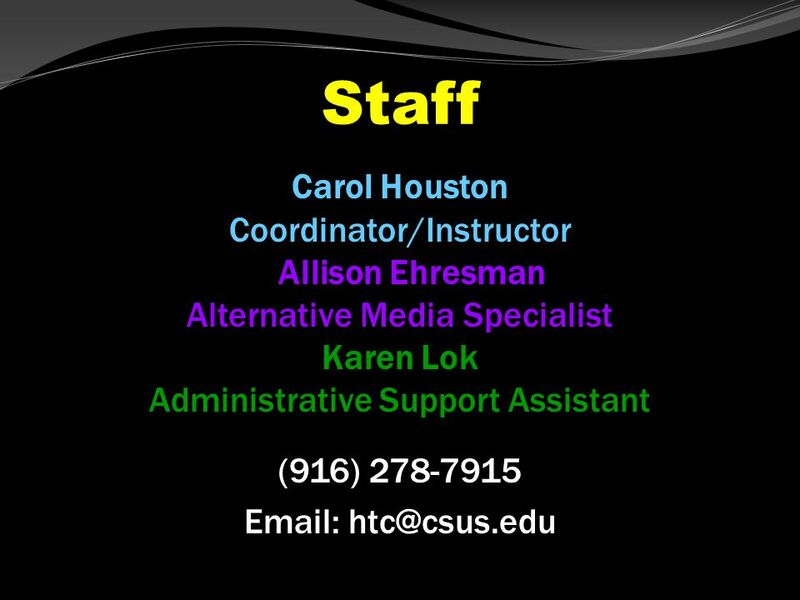 Download ppt "Services to Students with Disabilities California State University, Sacramento AIRC 2010-2011 (916) 278-7915." DISABILITIES AND ACCOMODATIONS. Disabilities & Accommodations Section 504 & ADA Civil Rights Statutes do not: Mandate affirmative action Create special. USING ACCESSIBLE COURSE MATERIAL – WHAT IS INVOLVED? Presenters: Kathy Buob, M.A. Lyn Clemons, B.A. Benjamin Tzeng Sengoku, B.S. 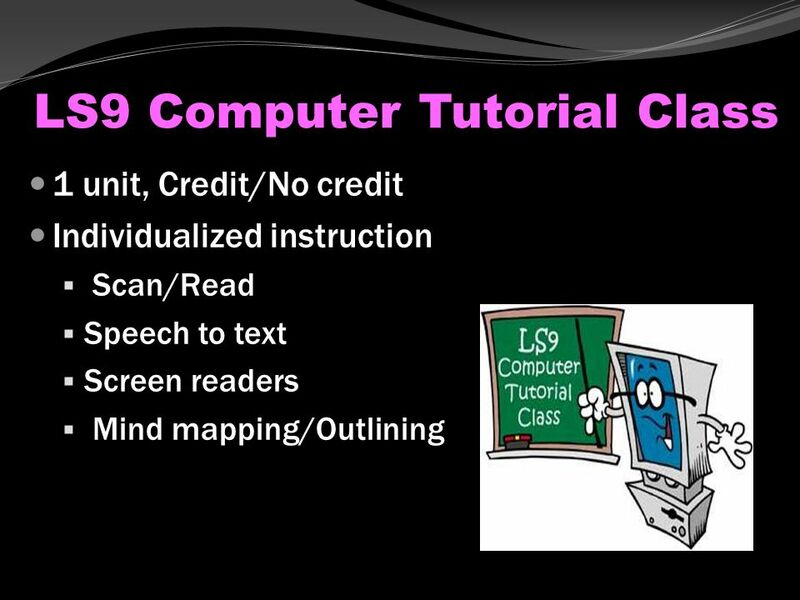 Using Assistive Technologies to Access Instructional Materials DET/CHE Conference 2008 Presented by Melissa Repa, M.A. Co-Director, Services to Students. 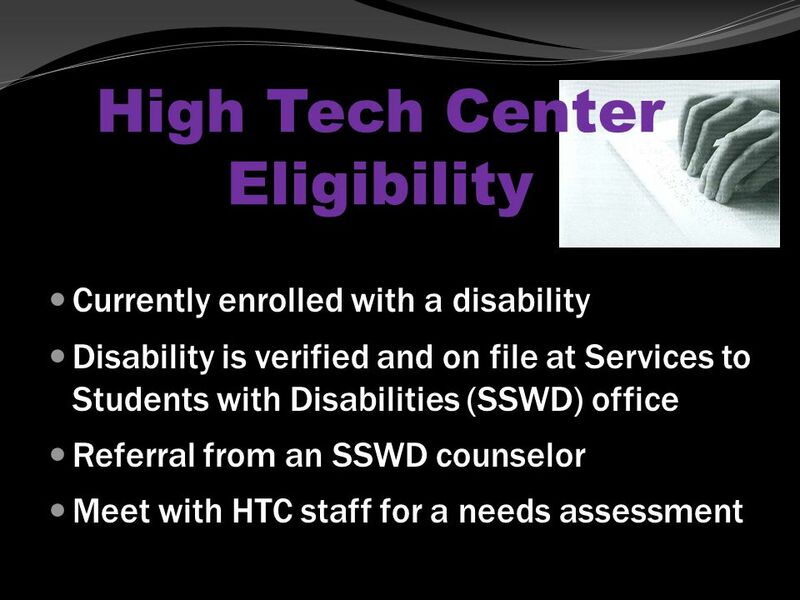 Assistive Technologies An introduction to resources available at Hartnell College. 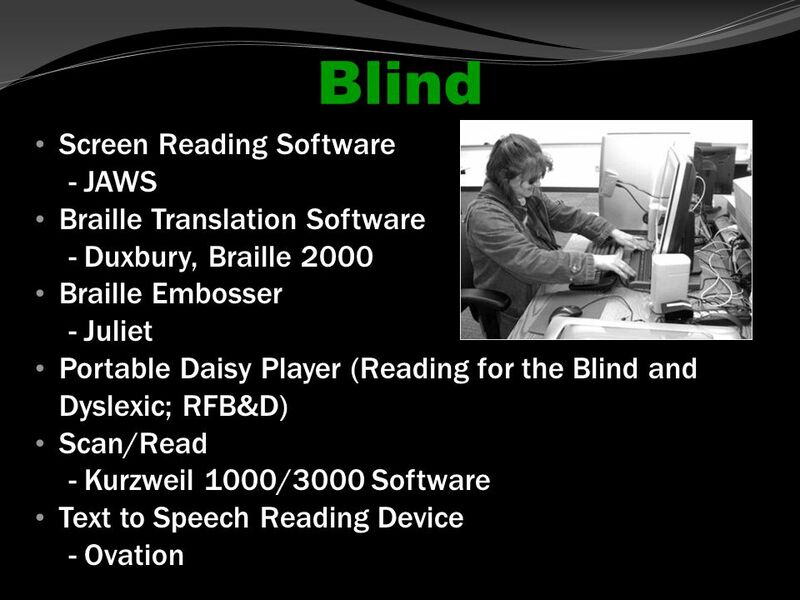 Who, What, When, Where and Why of Assistive Technology. Using Scan and Read Pro. 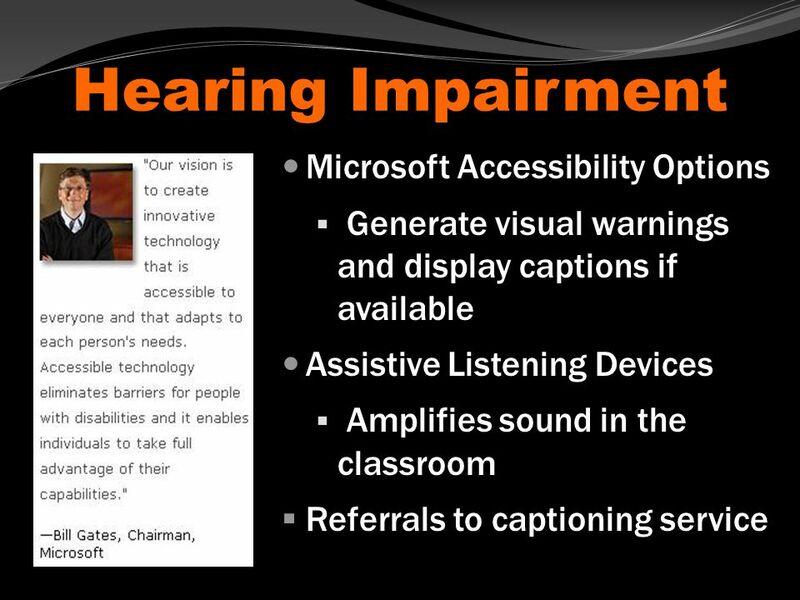 CTWorks Assistive Technology This presentation is intended to provide information about and how to use the assistive technology. 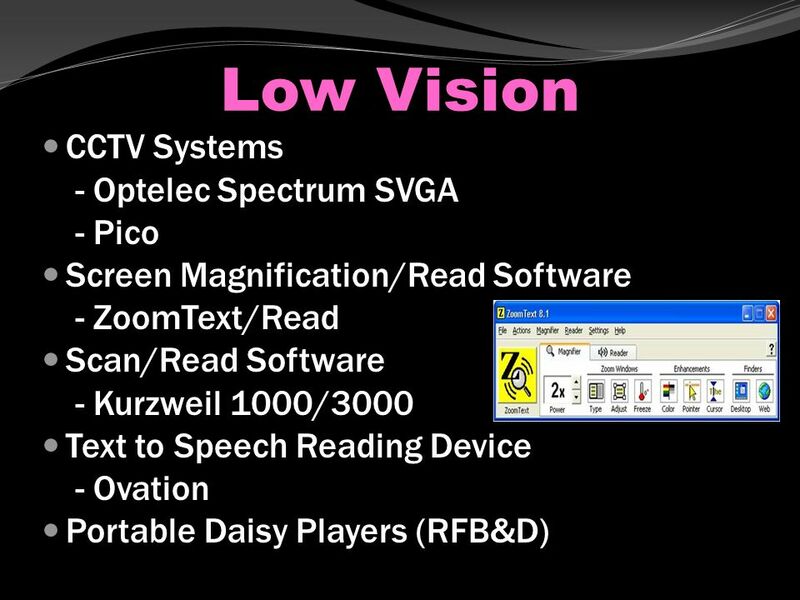 Assistive Technology (AT) for the visually impaired person by Raksak Chairanjuansakun. Braille keyboard/printer (H) Braille keyboard/printer (H) PAC mates (S) PAC mates (S) Voice recognition devices (S) Voice recognition devices (S) Magnifiers. The Governing Laws Change High School College The applicable law is the Individuals with Disabilities Education Act or IDEA. IDEA guarantees each student. 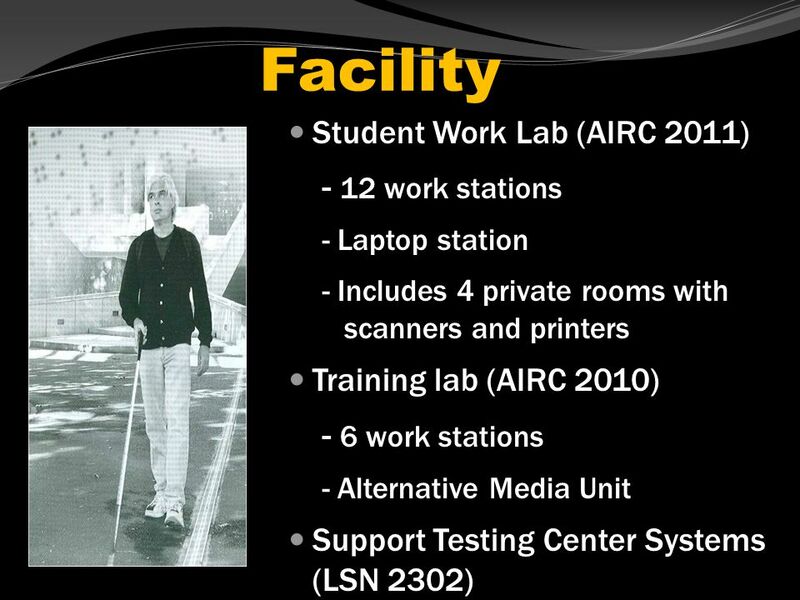 February 24, 2015 Allison Kidd, ATRC. Direct Services for CSU Students & Employees with Disabilities Ensure Equal Access to Technology & Electronic Information. AHEAD 2008, Reno, Nevada, USA July 14 – 19, 2008 Accommodating Blind / VI / LD Students Gaeir Dietrich Alternate Media Training Specialist High Tech Center. SETTING UP AN ALTERNATE FORMAT PRODUCTION SYSTEM By Robert Lee Beach Assistive Technology Specialist Kansas City Kansas Community College. Alternate Media and the CSU Context Mary Cheng California State University AHEAD Conference San Diego July 18, 2006. Computer Access for Disabled Individuals “The Computer as an Educational Tool: Productivity and Problem Solving” ©Richard C. Forcier and Don E. Descy. 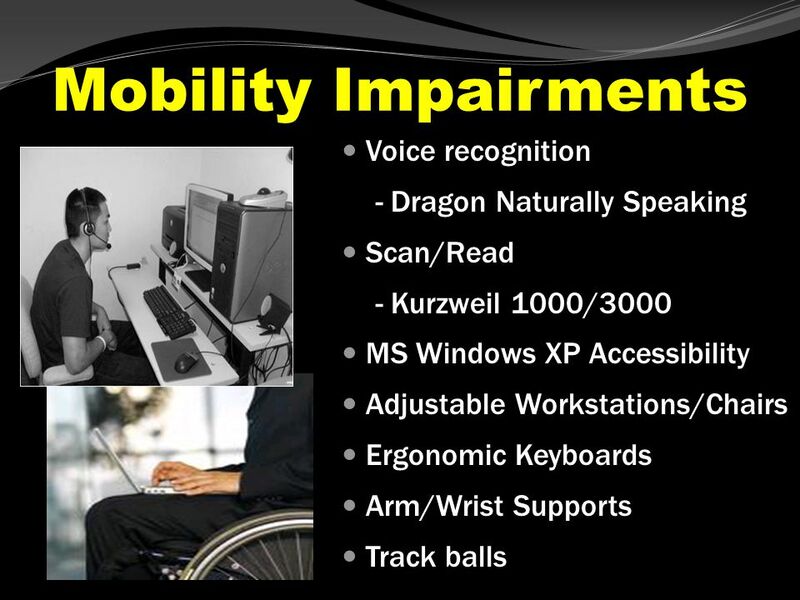 ASSISTIVE TECHNOLOGY. 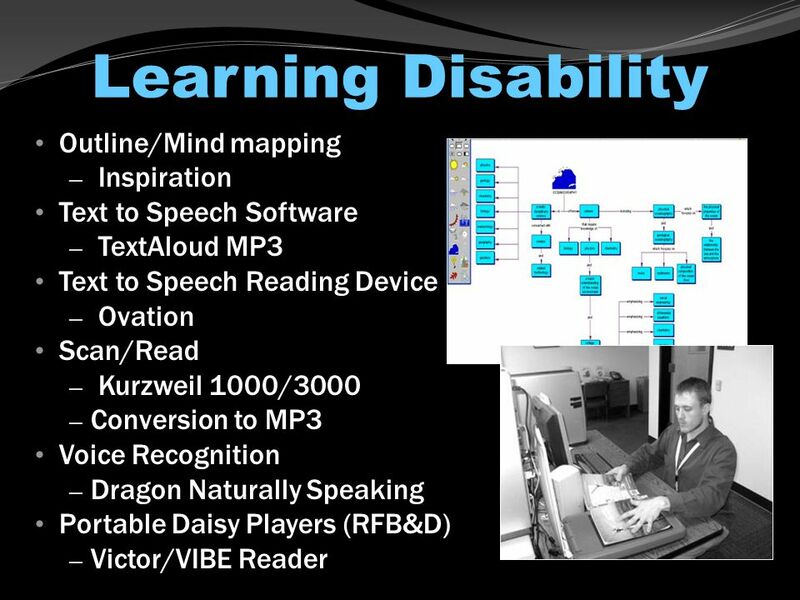 EXPLANATION OF ASSISTIVE TECHNOLOGY Assistive technology is any gadget that helps a students with a handicap finish an ordinary.